St. James has offered an excellent religious education in a disciplined setting for nearly 150 years. Our parish is a hard-working close-knit community with a lot of parental involvement and support. There is a long history of success. In just the past 20 years, St. James has produced several valedictorians and salutatorians in their high school graduating classes. Many academic awards and college scholarships have been received by St. James graduates. St. James Elementary School is located in the southwest section of Gibson County. It is a small Pre-K through grade eight school which has a rich history that dates back to 1847. This long existence is a testimonial to the strong tradition of Catholic education that is reflected by family, parish, neighborhood, and local universities and business working together to provide the best educational opportunities for the children and for the future work force in Gibson County. 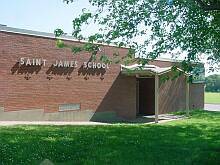 St. James is a rural school that comprises similar middle-class people with a similar socioeconomic background. The large extended families, the presence of both parents in most households, and a safe rural location are factors that enrich the environment of St. James. The importance of a good education is ingrained as students graduate from this school and strive for higher levels of education. Faith development is an essential part of the St. James community. This has been fostered by strong religious curricular programs and by the sacramental programs. It is essential that all students in the parish receive this training. Therefore, the school works with the parish programs to ensure the best religious training for all students. All students who attend St. James participate in weekly masses, rosaries, and prayer services. This participation helps students realize the importance of their role in these celebrations and their roles as future leaders in the church. St. James School is staffed by a lay principal, nine full-time teachers, a full-time fine arts teacher, one full-time preschool teacher, two preschool aides, and two primary teachers' aides. St. James welcomes students of all races and religions. Class size varies from 12 to 24 students which allows for more individualized attention for those students in need. Student achievement is reflected in their successful participation at speech meets, academic competitions, and ISTEP+ scores that are at or above the state average. The staff of St. James is committed to all children. They are willing to try new ideas and work on curriculum alignment that is going to benefit all students.